You are here: Home / Content / Another major project. How we delivered an incredibly simple and cost effective multimedia presentation solution for a meeting room. We love new challenges, because it forces us to do a better job every time. When our client asked us to deliver simple and cost effective multimedia presentation solution for its meeting room, we knew the right answer. A fully integrated conference room is an essential part of our clients communication strategy and they heavily relied upon. 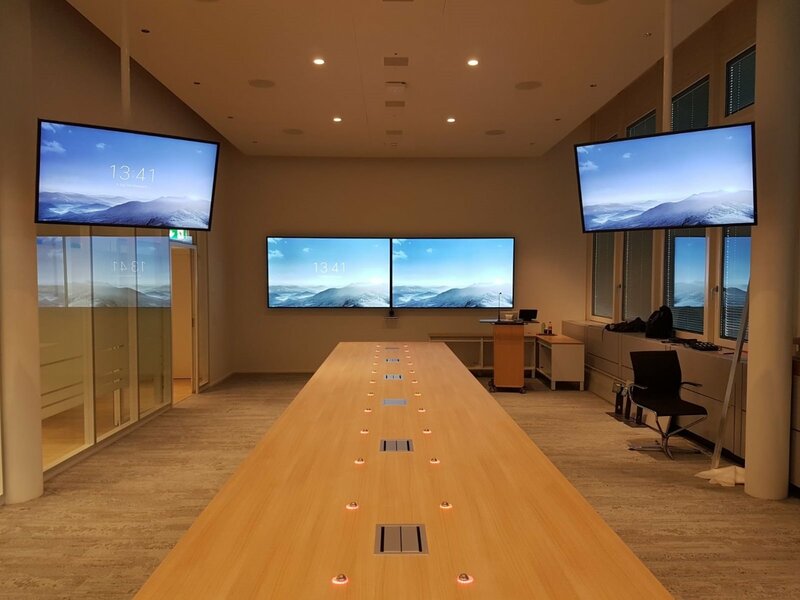 The room is outfitted with audio and video conferencing, enabling quick connection with colleagues and business partners around the world. Table mounted microphones provide clear voice pickup. 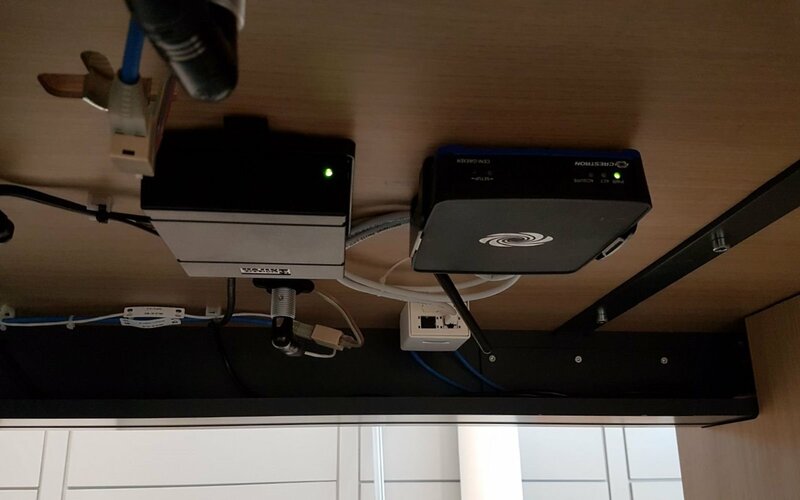 Because the client wanted a clean table, the best solution was to use incorporated Shure microphones connected to a ClockAudio digital Automixer rather than a discussion system. A PTZ camera mounted below the displays keeps the participants focused on the people they are communicating with. A high definition video display system with four NEC displays and sx 80 codec for dual video allows presenters to quickly show content from a room based PC, digital laptop connections at the table, or a cable TV tuner and share it with the far end. The signal transmission is handled through Crestron extenders. 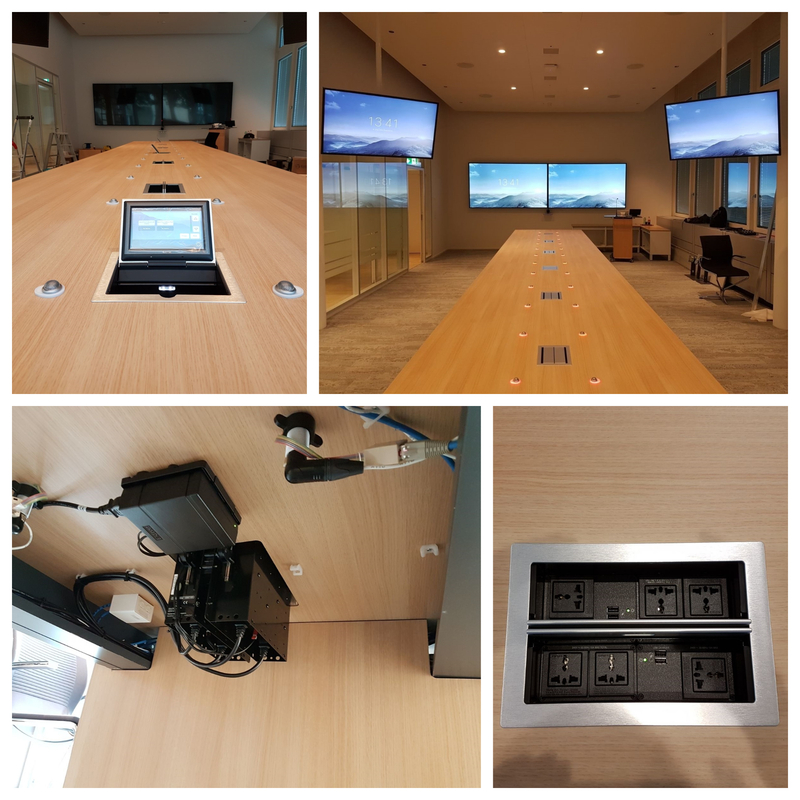 All system features a table top touch panel providing complete control over the audiovisual system via an enterprise wide standard user interface. Quickly turning the system on and off, selecting audio or video sources, adjusting volume, dialing and conferencing control at the touch of a button. Our client places a high value on ensuring each of their technology enabled rooms are always functional. If needed, the help desk representative can access the touch panel remotely to help resolve any system setup issues and get the meeting on track as fast as possible. We clearly feel that spaces like these create an environment of quick and easy access to people and information enabling instant decision making and collaboration regardless of physical location.